That’s It. I’m Buying an RV. I’ve found myself recently looking wistfully at the blogs of RVing families, like The Happy Janssens and The Ticknor Tribe, imagining what it would be like to sell everything we own and move into an RV. Aside from the fact that neither my husband nor I have any practical skills that could bring us money on the road, and the fact that constant travel, while it would bring us the chance to have friendships with a broader range of people, would potentially hinder the development of deeper relationship connections, RVing is quite appealing to me. I love road trips. I love mapping out the route and finding fun places to stop along the way. There’s a difference in experiencing a place from the outside in, like you can when you’re driving to that place, than from just jumping into the place from an airport and bypassing everything in between. And as anyone who’s ever traveled with me can attest, simply bringing my dwelling with me on the trip is the next logical step in the evolution of my road-tripping life. In addition, I just love all of the nooks and crannies and tiny little spaces that are in RVs. Everything goes somewhere. It has to. There’s nowhere else to put it. It would be like a really advanced decluttering exercise to pare things down enough to fit all of our possessions into the storage space in an RV. When we were in California, my husband’s grant was running out and his job search was taking longer than we’d anticipated. I looked into all manner of contingency plans to try and make our money stretch further in the event that his income stopped and there was no concrete prospect for future income. One option I explored was selling everything in our apartment but the bare minimum, and moving my husband, our then two-year-old daughter, and our two cats into a small RV. We could, I figured, live at one of the nearby campgrounds. My husband could take the car to work and my daughter and I could go hiking every day. When my husband got a job just weeks before his funding ran out, I was relieved, but also just a tiny bit disappointed that we hadn’t had the chance to do something so bold as to live in a vehicle. We had to settle for moving to Salt Lake City, which at that time seemed pretty darned bold. When I spoke with my husband about this, he was very calm. “This too shall pass?” I suggested. “Well, yeah,” he said. “I like that you look at things from so many different perspectives. And I know that you have to go to extremes to get things to make sense. If you’re here,” he put one index finger down on the table, “and you want to make a change, you think about going here,” he put his other index finger about 18 inches from the first, “so you can end up here,” and he moved his second index finger to a spot just inches from the first. Yep. My husband knows me. I know that the only reason I’m fantasizing about buying an RV is that I’m trying to work something out in my head, something that I think is related to the rapid influx of material possessions (currently all over my living room floor) that occurred on Christmas morning. And Christmas night, the baby head-butted me in the nose while I slept. You may find this surprising, but being awakened by a loud crack inside your head, searing pain in your nose, and stars before your eyes isn’t the best way to start the day after Christmas feeling relaxed. In fact, I feel quite squirmy and unsettled. Facing three days with my husband back at work, I find myself thinking, “What on EARTH am I going to do with these children?” And I have the babysitter for three hours Monday afternoon (and I’m thinking, “What on EARTH am I going to do with three hours on my own?”). I guess I could always go looking at RVs. Or maybe I could just rearrange furniture. Life aboard is fairly easy. It seems that most of the work we do requires daylight or some bit of warmth so we end up getting all of the chores (taking out the trash, laundry, grocery shopping, errands, fixing the boat, etc.) all done in the day time. After dinner is kid bedtime and dishes and then we’re free every single night to read, be online, have friends over, play games, or do whatever we want to. It’s pretty freeing to not have another load of laundry to fold or a floor to sweep or toys to pick up (all things I did before I ever sat down at the end of a day in a house). For the next several months our focus is going to be planning routes, emergency plans, communication plans, etc. Lots off stuff but we have the mental and time space to do so. The other part I really like is that since we’ve jumped right out of normal life and into the cruising preparations we’ve met an amazing community of like minded people who all tell us every day that it’s worth it. In fact, today we met a man that sailed with his son from 6 weeks old until college (jobs and breaks along the way). There’s an older retired commercial fisherman down the dock that sails for about half the year that knocks on my hull to give me advice whenever he comes up with another idea that will make our boat more ready to go. There’s a mom in Australia that I’ve been talking to who has cruised for the last two years with her three small children who responds to my questions and sends encouragement often. There are the friends that kiss my kids on the forehead and read them a book. We knew where we wanted to be for a long long time. We’ve been working on this plan for a good ten years and it’s everything we hoped it would be and we haven’t even actually started the good part yet (clear, clean tropical water). Oh, and I’ve never ever felt as settled as I do now on my home that moves. What is it that fulfills you deep down about living onboard s/v Convivia? Is it primarily the realization of your long-term dream of traveling about? Or is there something about sloughing off the material things that hold us down that gives you satisfaction? My husband and I were talking about it last night, and he asked me this question (except about selling our stuff, including stuff that could be/is useful but that we choose to live without), and I didn’t have a very well-developed answer. I just feel this urge to lighten our load. We have agreed that next time the opportunity presents itself, we’re going to choose a dwelling that more closely matches our ideals (smaller living space, focus on the kitchen and the outdoor spaces, useable space/storage built in). We like the house we’re in, but there’s quite a bit of space that we just don’t use and I feel like it’s hanging over my head (quite literally…it’s basically the entire upstairs). What I like about life aboard is how very simple everything has become. We have lots of time to focus on relationships (family, friends, and ourselves) because we don’t have to spend hours every night sweeping the floors, or doing laundry, or cleaning up 1300sq ft of kids messes. Relationships are important to me. Sometimes (on shore) we would choose to skip this stuff, but it was still there, like psychic pair of lead shoes. The stuff too, was a huge burden. I had nice guitars, nice computers, nice stereo, nice espresso machine, nice theater… the list goes on. When you have all that nice stuff, you feel like you should be using it. Somehow the “should I watch a movie tonight, or write a new app, or play my guitar” dilema became oppressive. All those things that were supposed to make my life happier and easier were complicating things and bringing me down. The other thing I’ve been noticing as I’ve been reading a ton of lifestyle design blogs is that really all you need these days is a good computer (and internet) and you’ve got ≥75% of everything you need (books, music, movies, education, communication, self expression). For me the “what can we jettison” question has become a fun game. Almost all of the old stress associated with getting rid of my stuff has gone; replaced now with a sense of pride. How long can my response be? I live on a boat and if it wasn’t for kid stuff we would absolutely be minimalists around here! An e-reader and a vitamix and you’re good to go. All of these dress ups and crayons really get in the way of my decluttering! On the topic of becoming friends with transients… It’s on my mind right now because our brand new friends that we met in November, who we feel close enough to arrange new life plans around, are leaving to go sailing (for 2 years) in 10 days. I suspect that we’ll see them again but that someday has weather windows and a 3-4 week sail across the Pacific first. I’ll be writing a blog post about them and the topic soon. Have you read http://www.freeplaylife.com? 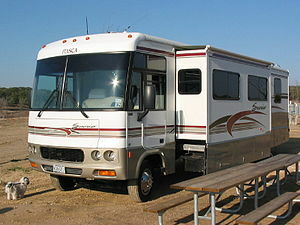 In January 2010 she blogged daily about her 30 days of selling everything she owned in a 4700 sq foot house to buy an RV and travel with her three kids. They’ve since moved into a small apartment and I don’t think they regret it for a second! Also, have you read www. theorganicsister.com? That’s another one you’d like on many levels. So what I’d do is jump. Sell the house, buy the RV, drive wherever, live simply, figure out the money stuff somehow. It’s so so worth it! Although you’d have to find something to do with yourself when you felt like rearranging furniture.